Ruby: Review, Author Guest Post, and Grand-Prize Giveaway | What YA Reading? When Ruby is sent to live in a huge manor with her distant grandmother, she has no idea what the future holds. It’s hard enough to deal with a new town and a mysterious boy. Little does she know that she’s part of a prophecy that dates back to the Salem Witch Hunts. Years ago, a witch cast a spell on the one child who could save the world from darkness – and it’s Ruby’s job to protect it. Yes, this is another blog tour! My stop was actually scheduled for August 18th— a day that officially ended about 45 minutes ago. However, yesterday morning I still hadn’t finished reading Ruby. In fact, according to my Kindle application, I was only 35% percent into it. I debated on writing a short blurb on the novel based on what I had read but ultimately decided that that would be unfair to Ruby, and so I forsook the schedule and finished the book. I even sacrificed my Spider-Man movie marathon to do so. Yes, it was that intense. To start this review off on a positive note, the fact that I read most of Ruby in less than 24 hours is proof enough that this read is light, entertaining, and easy. You could effortlessly read the whole of it during a weekend getaway or, if you’re committed, in one sitting. I, of course, read it in over the course of a day and found whole thing to be easy to follow and seamless. Furthermore, Ruby‘s characters, although perhaps a tad two-dimensional, had me emotionally invested in them by the end of the novel. I nearly cried when one of the cast was thrust into mortal danger, and Ruby’s grandmother, Esther, was absolutely lovely. I’ll admit that I’ll miss her in the next few days. 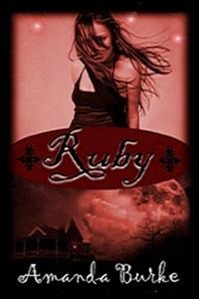 Nonetheless, I would like to dwell on one issue that I had with Ruby, mostly because I find it to be somewhat of a trend within YA novels recently and it’s one that I’m not a fan of. This book, however, takes that trend to a whole new level. When romance is instantaneous, I usually call it Spray Tan Love. But this, I don’t know what to call. Tanning Bed Romance, maybe? Fake Nail Fondness? Irritating infatuation? I can’t decide. What do you call a romance that only takes roughly 2% of the novel to come to a very passionate life? Hmm, how about ‘fake’? But that’s enough with the criticism. To move forward, I highly enjoyed Miss Burke’s plot. Although it involved many overused elements—witches, warlocks, and demons, to name a few—she managed to weave her tale into something original. I especially enjoyed the way she made even her magically adept characters vulnerable to human illnesses; it gave Ruby an authenticity that it may have lacked otherwise. I did not see the grand-finale plot twist coming in the least. In fact, to be honest, I still don’t fully understand it. But this lack of understanding is more of a reel-er-in-er than a cliffhanging annoyance. I’m giving Ruby 2.9/5 stars. This one is for fans of lovely grandmothers, new spins on overly-told tales, and Fake Nail Fondness. The books from where these quotes came were ones that I read in my teens and shaped the kind of writer I wanted to be. Each one is a favourite of mine and I try to reread them all at least once a year. This advice has been wonderful for me and I think of it often. As you may or may not have guessed by looking at the picture above and giveaway below, this is one huge grand-prize giveaway. 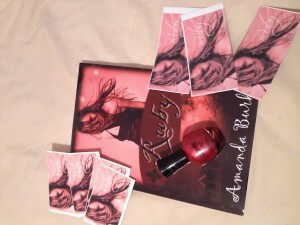 It includes one paperback copy of Ruby, one vial of red nail polish, 7 sticker/ card packs, and… one 10$ Amazon giftcard! Yes; our contributors are feeling generous! So a big thank you goes out to Miss Amanda Burke herself for providing us with these lovely prizes. What are you waiting for? Scroll down and get ready to win! Pingback: Torn | What YA Reading?